What is the Preparation for Starting New Engines? New Engines When Dispatched From The Work Have Their Ports and Opening Sealed With Appropriate Covers. 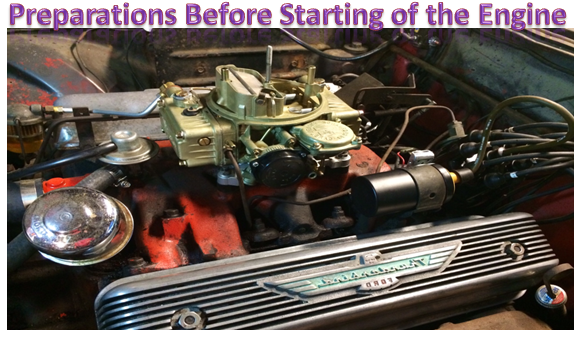 Ensure That All Covers are Removed Before Commissioning The Engine . Fill recommended grade of fresh oil in the sump to the high mark of the dip stick. Add half litre more to compensate for the lub oil filter . Fill up the fuel pump governor with the same grade of lub oil from the plug provider at the top of the governor housing . To check oil level in the governor . Loosen the oil level control plug , painted red , provided on the inspection cover at the rear of the governor housing . After starting the engine again check lub oil level in the oil sump and top up if required . Check the fuel tank is cleaned fro inside . Fill the tank with cleaned HSD . Bleed the system as shown in the maintenance manual . Fill the radiator with either fresh treated water or with coolant . Grease the water pump bearings with suitable grease . After starting the engine recheck water level in radiator and top up if required . Check battery for correct voltage and current capacity . Check battery cable are correctly connected and secure . Check oil , water and fuel levels – top up if required . Check air cleaner choke indicator – on dry type of air cleaner . Clean engine with a dry cloth . Drain water from water separator provided in the fuel line . Crank the engine . As soon as engine fire , release the starter switch . keep the ignition switch in ON position . Do not crank the engine for more than 10 sec at a time . If engine fails to start , wait for a minute and try again . Check the oil pressure . Allow the engine to idle for 3 minute before loading the engine. While the machine is in operation , check engine oil pressure , water temperature and battery charging rate at regular intervals . Unloaded the engine and let it be idle for about 5 minute . Check the lube Oil pressure and water temperature. Stop the engine with the engine stopping lever . Check oil level after 30 minute and top up . Top up fuel tank . The following schedule of maintenance is based on normal operation of engine. In case of severe operating conditions like extremely high atmospheric temperatures, extremely dusty atmosphere, severe duty conditions etc., the frequency of this schedule has to be increased. 1.1: Check lub. oil level and top up if required. 1.2: At the end of day’s work fill the fuel tank completely. Before starting drain the moisture accumulated in the tank by loosening drain plug at the bottom of the tank. 2.1: Clean the air cleaner element by lightly tapping it on wooden block. 2.2: After initial run of 50 hours tighten all external nuts and bolts, especially the cylinder head nuts. 3.1: Drain the lub. oil from sump and refill with new lubricating oil. Clean lub. oil strainer. 3.2: Clean, cooling air passage and the fins on cylinder liner and head. 3.3: Change the fuel filter element. 3.4: Change the lub. oil filter element. 3.5: Clean ceramic filter at the bottom of fuel tank. If necessary replace it. 3.6: If oil bath type air cleaner is used, change the oil and clean the element. Change the paper element of the air filter. 5.1: Knock out soot from exhaust silencer. 5.2: Check and if necessary decarbonise cylinder head, exhaust port etc. It is advised that a mechanic from your dealer/distributor should check up your engine. It is recommended that the engine is overhauled at the end of 3000 hours. A dipstick is provided on the lub. oil filter casing. It carries minimum and maximum oil level marks. If the level is below the minimum mark add lub oil through the dipstick hole. The quantity of oil required to raise oil level from minimum to maximum mark is 0.7 lit. (1.25 pints) for single cylinder engine and 1.3 lits for twin cylinder engine approximately. Remove lub. oil filter casing. The strainer is fixed to the lub. Oil pump body by means of worm clip. Loosen this clip and pull the strainer towards flywheel end. Clean it thoroughly from inside and outside by ‘means of kerosene. Refit it and fix the lub. oil filter casing. First drain all the fuel from fuel tank and disconnect the tank to filter pipe. Unscrew the holder at the bottom of fuel tank. This holder carries the ceramic filter. The filter can be cleaned by washing it in clean oil and by blowing air through it. If it is choked completely, replace it with a new filter. Fuel oil invariably contains water in moisture form. This will corrode the injection system. Hence, never run your engine without the ceramic filter, which filters the water in the fuel. In order to prevent sludge formation, it is desirable to flush the engine with the flushing oil at the time of changing oil. This is specially to be done when the used oil is excessively dirty.